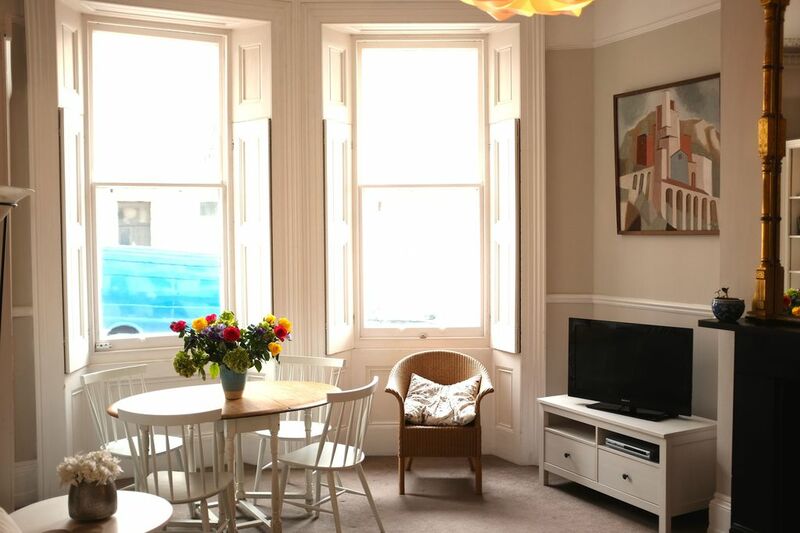 The apartment occupies the entire ground floor of an historic bow-fronted Regency townhouse located in one of Brighton's premier conservation areas. There are sea views from the front room and the charming south-west facing garden provides a quiet space for relaxing in the afternoon sunshine. The excellent bars, shops and restaurants of fashionable Kemp Town are close by and Brighton city centre is a 15 minute walk along the seafront. On-street parking costs £5.20 per day. I was born in South Africa and have lived in the UK since the 1980s. I have always enjoyed spending time by the sea and have got to know Brighton very well over the years. This town has it all - vibrant night life, fantastic shopping, a cosmopolitan arts scene and outstanding natural beauty. When I viewed this apartment it was love at first sight, it has real character and is my favourite place to relax and unwind. For me the best thing about this apartment is its tranquil atmosphere. It is a well-proportioned space with high ceilings and is full of sunshine and natural light. It is a wonderful place to escape to, yet only moments from the buzz and action of Kemp Town and the city centre beyond. Family bathroom with wc, bath/shower over, sink, heated towel rail, shaver socket. Towels provided. Comfortable lounge with 3-seater sofa, 2 armchairs, bookcases, dining table and 4 chairs, high ceilings, cornicing and marble fireplace, flat screen HD television with freeview channels, Free wi-fi, DVD player and digital radio. Sea views. Fully equipped kitchen with hardwood work surface, electric oven, gas hob, fridge, toaster, microwave and dishwasher. There are 3 good golf courses in the Brighton area. Notes on accommodation: Free wi-fi, central heating and constant hot water. Cot and high chair available on request. No pets or parties. Strictly non-smoking. Outside: Sole use of a pretty south-west facing patio garden with garden furniture. Utility Room: Washing machine, iron and ironing board. Cleaning / Towels / Linen / Maid service: Towels and bed linen provided. For stays of over one week, towels and bedlinen are changed every 7 days. The flat was extremely comfortable with all that we needed for our stay. It is in a very convenient area, close to restaurants and the Marina. We did not find parking difficult once we got to know the streets around us. Various surprises such as the welcome basket, the accommodation very close to the sea. Everything we did and wanted to do was in comfortable walking distance. So pleased you enjoyed your stay in the flat and in Brighton. We look forward to welcoming you again in the future. Could have well given 5 stars. Maintenance man was very helpful. Would like to come again. Down side expensive, and hall gloomy and down market. Location very good for everything. Enjoyable stay. Very comfortable flat. Shops etc. near by and transport was excellent. Only criticism is that the second bedroom, bed was not made up on arrival, and the bedroom was very small with the bed extended to full width! Great location, everything you could need in an apartment. Thoughtful welcome pack. We had a fantastic few days. Perfect for a small family. Great location. Well appointed and a very welcome 'welcome basket'. 1 minute walk to the Marine Parade promenade with easy access to the beach. The Palace Pier and Brighton city centre are a 15-20 minute walk away. London Gatwick airport is a 45 minute drive, London Heathrow is 90 minutes away. Brighton railway station is a 10 minute drive or 15 minutes away by bus. Travel by train to London takes 55 minutes. Cycle hire is available nearby as well as excellent bus services. 'City Car Club' vehicles are also available close to the flat. On street parking costs on Marine Parade costs approximately £5 for the full day. Brighton Town Centre with the Palace Pier, Royal Pavilion and the famous Lanes are 20 minutes walk away. Lewes old town with its famous antique shops and market is 20 minutes away by car. Brighton is the ideal base for exploring the south of England, with its lovely gardens, castles, stately homes and national parks. Sussex boasts numerous theatres and arts festivals, golf courses, horse racing, ancient churches and buildings plus walking and mountain-biking on the beautiful South Downs and in Ashdown Forest. Security deposit: I require a £200 deposit upon booking to reserve your stay and request full payment plus a refundable £200 breakage deposit 4 weeks before your stay. The breakage deposit is refunded within 14 days of your departure (less any damage if incurred). Changeover Day: Changeover day flexible. Check-in 3pm, check-out 11am. Minimum 3 night stay (7 nights during Peak Season). Please ask about long bookings at a discounted rate. Prices to June 2017: Low Season (October to March): £110/night midweek, £120 for Friday, Saturday and Sunday nights and public holidays, £650/week. Minimum 3 night stay. High Season (April, May, June, September): £120/night midweek, £130 for Friday, Saturday, Sunday nights and public holidays, £750/week. Minimum 3 night stay. Peak Season (July and August, Easter and Christmas/New Year): £800/week. Minimum 7 night stay.